Abstract: As never before, at present the beach management requires a realistic framework for effective intervention. This paper analyzes the trends of the sun and beach tourism and the relationships among three of the main change drivers, which are the quality services demand, the public use and enjoyment, and the environmental sustainability, under the assumption that the economic profits are positive. A general, theoretical model with three alternative scenarios is formulated to provide a realistic framework in which of those relationships can be understood. 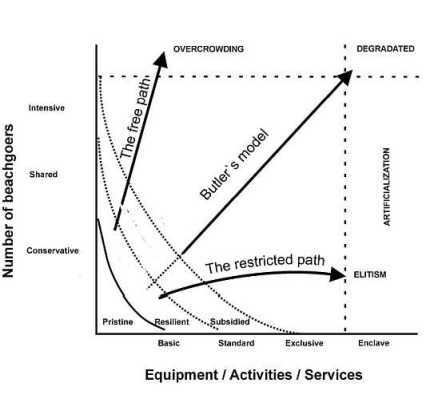 Overcrowding, degradation and artificialization are the final stages for the scenarios in which the interactions among change drivers are disregarded. Beach management is forced to decide between two mutually exclusive alternatives: quality services on the one hand, or social equity on the other. Also relevant components of the integrated analysis are the economic viability and the environmental sustainability. Since the former one turned to be non-negotiable (profits are a sine qua non condition), the attempts to reach a compromise between high quality services and massive enjoyment derive in either selective elitism or environmental degradation. Successful alternatives require that the beach management takes into account the above mentioned relationships among the main change drivers.